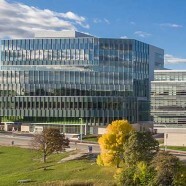 With an eye towards innova­tion, the University of Minnesota Health—a collaboration between University of Minnesota Physicians, Fairview Health Services, and the University of Minnesota Medical Center—utilized the design of their new Clinics and Surgery Center as an opportunity to rethink their care delivery model, evolve their brand, and reduce the cost of care to meet the future demands of healthcare. 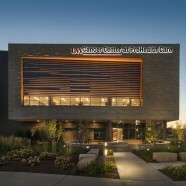 The result is a destination ambulatory care center designed to elevate an inter-professional care delivery model while providing an entirely new type of patient experience that introduces improved care delivery models, patient flow, and turnaround of outpatient procedures. 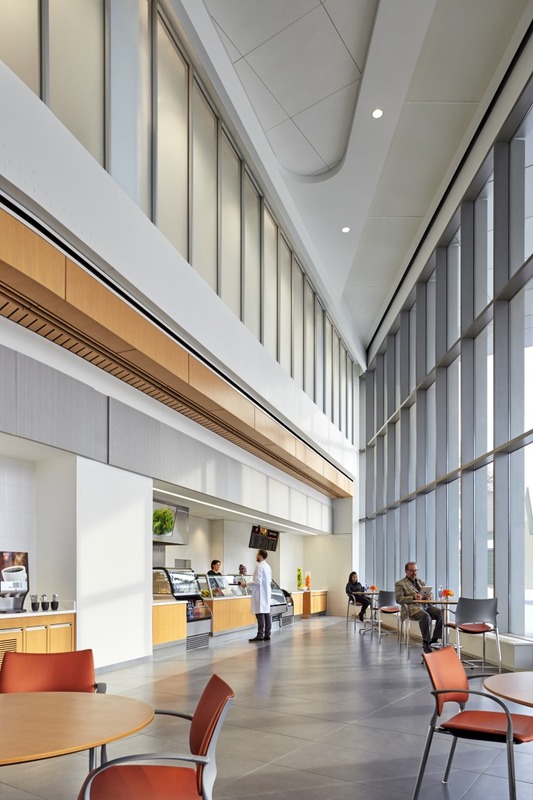 The design complemented operational innovations that helped save over $67M in capital cost, resulting in millions of annual operational savings. 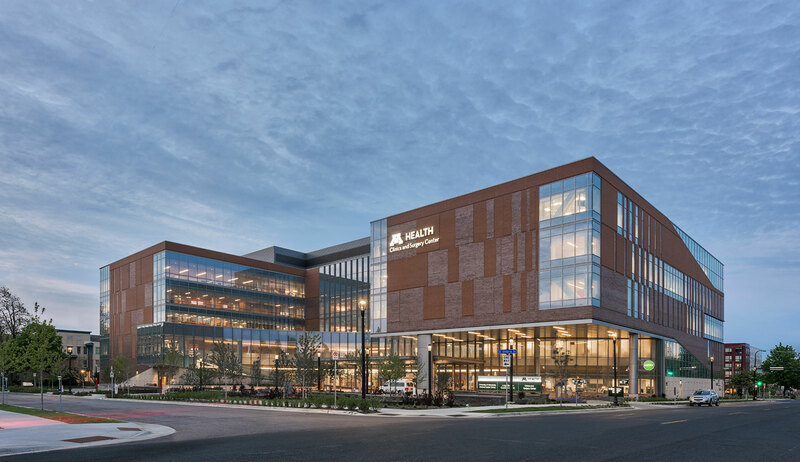 Building on consumer-centric innovations from other industries, our team worked alongside UMN Health using both operational and architectural design to orchestrate a patient experience that promotes personalization, convenience, and the elimination of touchpoints. 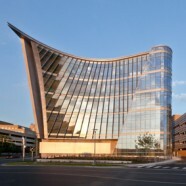 The building form and site orientation seamlessly flow with local traffic patterns supporting ease of access. Arriving patients are greeted by a valet and once inside are escorted by concierge staff positioned at the entry. 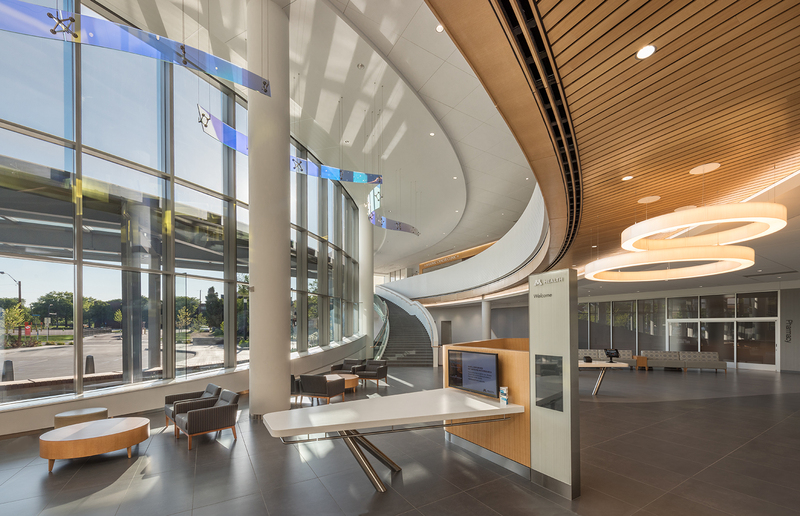 The Discovery Bar, a sculptural desk on the ground floor, provides access to educational materials and clinical trials. 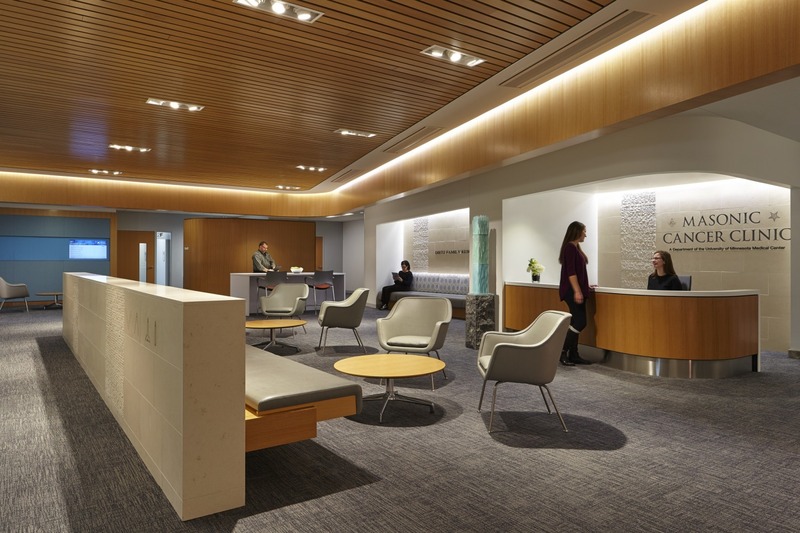 Technologically-advanced check-in solutions eliminate the need for a formal check-in process, and lounges are furnished with an array of different seating options that allow patients and visitors to choose their preferred setting instead of being assigned to a small waiting area. 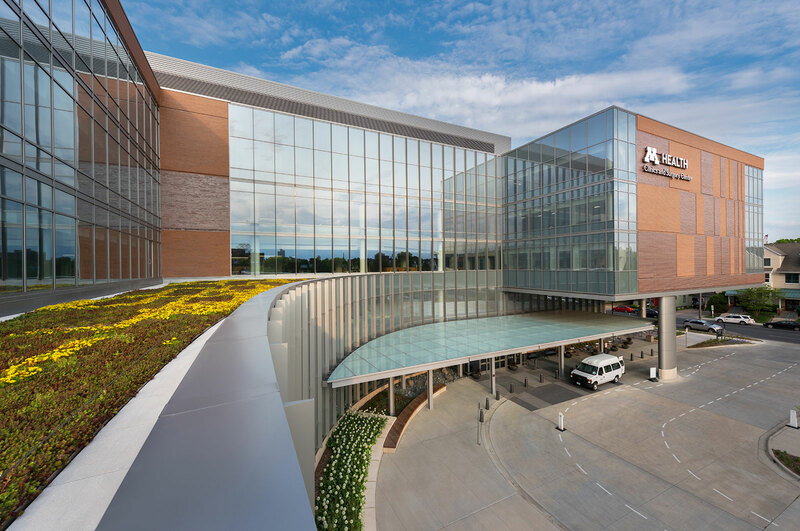 Our team saw the creation of the Clinics and Surgery Center as an opportunity to move away from dated historical precedents and truly rethink how we deliver care to our patients and community” said University of Minnesota Physicians Chief Operating Officer Mary Johnson. 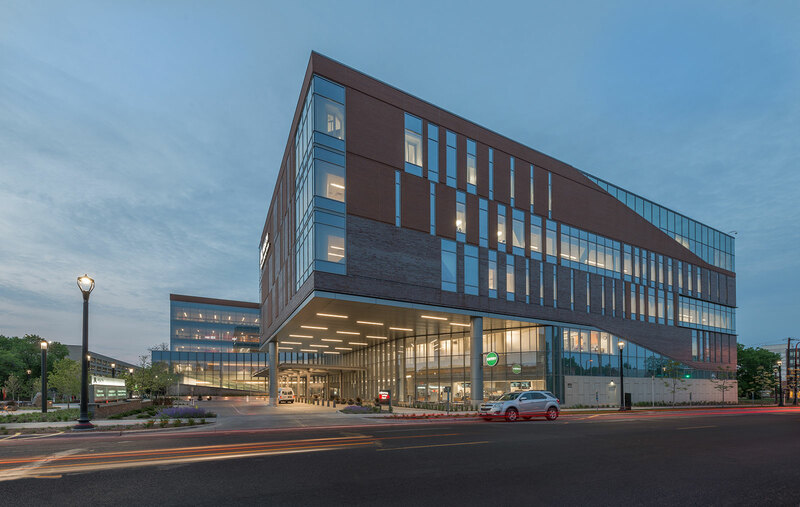 “We’ve paired leading ideas and best practices from healthcare and other industries to create an innovative facility that promotes a remarkably patient-focused care-delivery model. 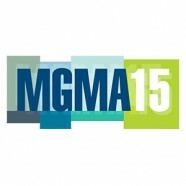 Clinical modules are flexible and easily adaptable to accommodate changes in program development, best practices, and innovations of care. Understanding the benefits of an inter-professional care model, high priority was placed on bringing medical, research and education professionals together for collaboration and teaching. 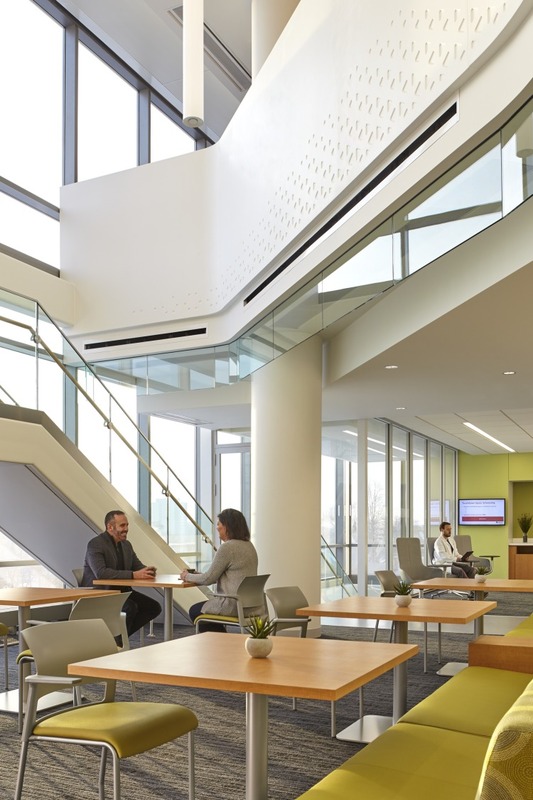 Designed under the premise that none of the employees require a full-time, dedicated workplace, workspaces are open and flexible with a focus on choice, collaboration, and access to daylight and views. Clinical collaboration areas, which can serve different clinics on different days, cut across clinic modules. Provider touchdown space wraps around the clinic modules to support out-of-clinic work. 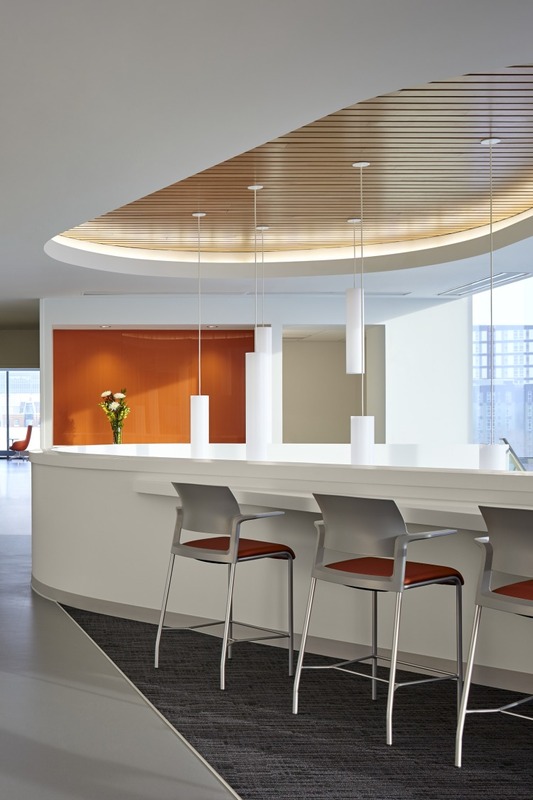 Finally, vertically-connected staff spaces promote a sense of community. 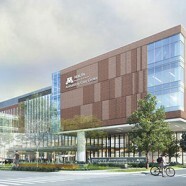 As the foundation of a future health district, the building’s design outlines a new architectural brand for UMN Health. Brick and terracotta on the exterior complement the local architectural landscape and native geology. 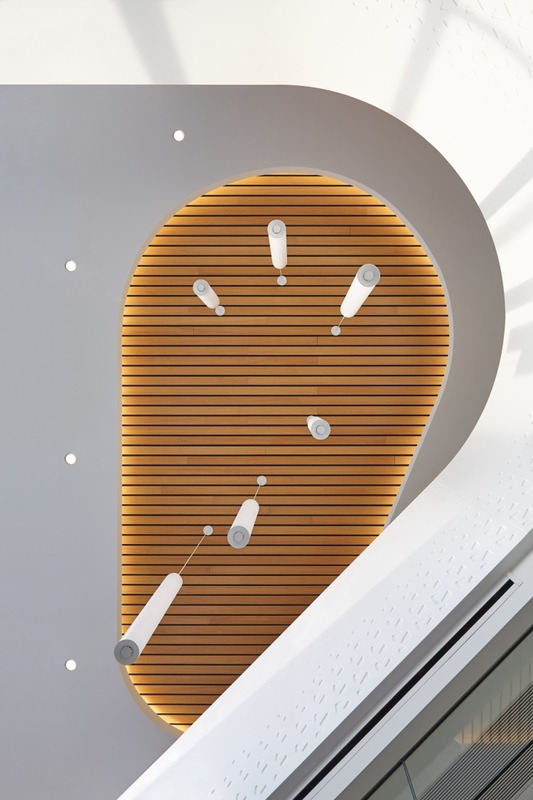 Inside, sculptural forms are used to carve away the mass of the floor plates and to provide connectivity between floors. 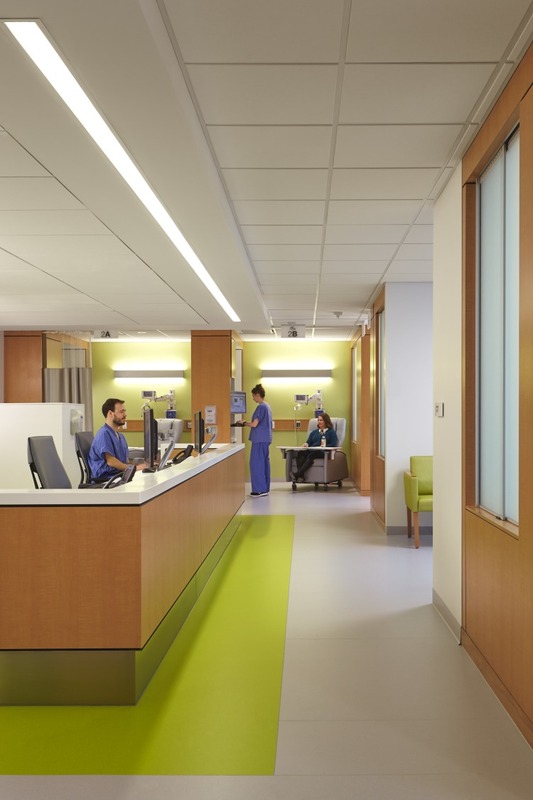 Color is used strategically throughout the space to identify clinic entries and neighborhoods in support of intuitive wayfinding.